"Now Lab customers can get your lab service on their own, 24 hours a day "
Allow lab customers to enter test requests, to retrieve reports, pay invoices and to get support from the lab in no time..
Labsols offers Customer facing portal for lab customers which will pull out details from Lab/LIMS database to allow lab customers to enter test requests and to retrieve reports, pay invoices and to get support from the lab in no time. For example with a customer portal your customers can easily view there instrument status as well its past certifications from anyplace, anytime. It is a web based Online System permitting you to manage sample related enquiries, Distribution and administration of Test Reports, Records in an effective manner. 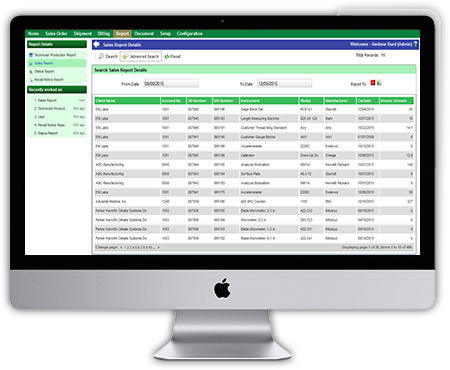 The solution also offers facility to view Sample Status, Test status, Invoices, Customer Statements through PDA and mobile devices. This application offers functionalities to the company beyond any other customer portal. This application is ready to start by any lab in few minutes and can be accessible from multiple locations. We have also integrated this application with Mobile Apps. It can be easily capture your present Lab process and offers excellent functionalities for you and your customers include Sample Management, Reports, Communication, Invoicing, Document Management, Log Management, etc. We have SPC Reporting and Analytic tools integrated with the system which is a great add on. Application is hosted in cloud platform (Windows Azure Platform) which gives customers and client opportunity to enjoy the maximum benefits of cloud including data storage, security, cost saving for installation and IT infrastructure etc. It is highly secure with all data managed over server (cloud) and provides simultaneous access for all users. Labsols LIMS not only handles the "nuts and bolts" functionality to satisfy your compliance requirements, but also adds powerful reporting, advance analytics, plotting and viewing tools not found in any other LIMS system.